The Obama Administration has released April data for the Home Affordable Mortgage Program (HAMP). 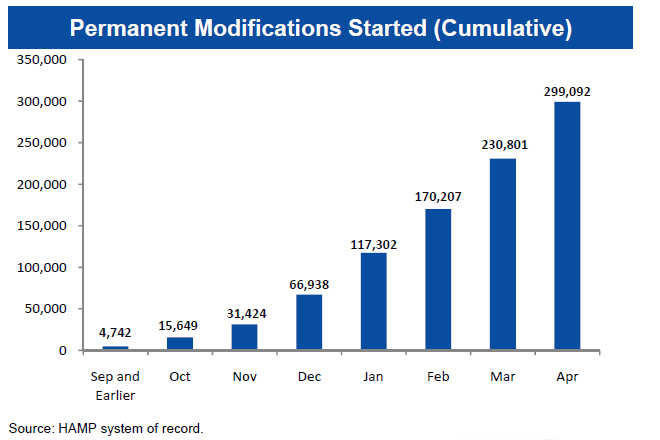 The number of homeowners who completed HAMP's mandatory 90 day trial period and were converted into permanent load modification status rose 68,000 to 299,092 in April. This is a 13 percent increase over the number of permanent modifications reported up until the end of March. All borrowers converted to permanent modifications received a reduction in their loan's interest rate; 53.4 also received an extension of the loan's term and 28.6 were given principal forbearance. According to the report, lower monthly mortgage payments for borrowers in active trial and permanent modifications represent a cumulative payment reduction of more than $3.1 billion to date. The median savings for borrowers in permanent modifications is $516.09, or 36% of the median before-modification payment. FHA Commissioner and HUD Assistant Secretary for Housing David Stevens said, "As the number of homeowners receiving permanent modifications continues to increase, the Administration's comprehensive efforts are making an impact in the housing market's overall recovery. Today mortgage rates remain at historic lows, around five percent; foreclosure starts are down 27 percent from last year this time; and home prices and the pace of home sales have stabilized in recent months." 47,160 new borrowers had began trial loan modifications at the end of April. Of the 1,487,594 offers that were been extended, 1,214,085 borrowers have enrolled in the program. In terms of the overall conversion rate, 20.1 percent of all offers extended have been converted to permanent loan modifications, much improved from last month's rate of 16.1 percent. When measuring performance against the number of HAMP trial offers that have actually been accepted, 24.6 percent of homeowners who have completed the 3-month period have been converted to a permanent modification. Again, much improved from the 19.8 percent conversion rate reported in March. 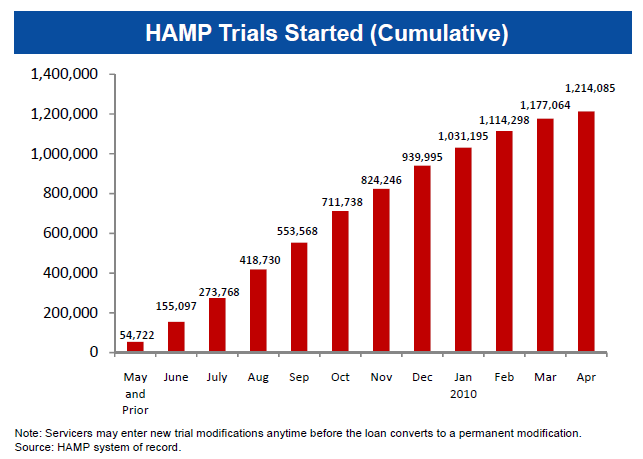 The primary criticism of HAMP almost from the beginning has been the low rate of loan modifications that were converted to permanent status after the mandatory 90 day trial program. While over 900,000 homeowners had entered the HAMP program by the end of 2009, fewer than 70,000 had been converted to permanent status. It was to be expected that conversions would trickle in initially, but many loans seemed stuck in trial status. Since the first of the year, program administrators have attempted to isolate the problems that were leading to delays and/or failures in conversion and have employed a number of measures to improve performance. "The number of homeowners receiving significant relief through a mortgage modification continues to rise," said Chief of Treasury's Homeownership Preservation Office (HPO) Phyllis Caldwell. "Our focus now is on improving the homeowner experience and holding servicers accountable for their performance. Increased transparency through more robust reporting of servicer-specific data will contribute handily to those efforts." 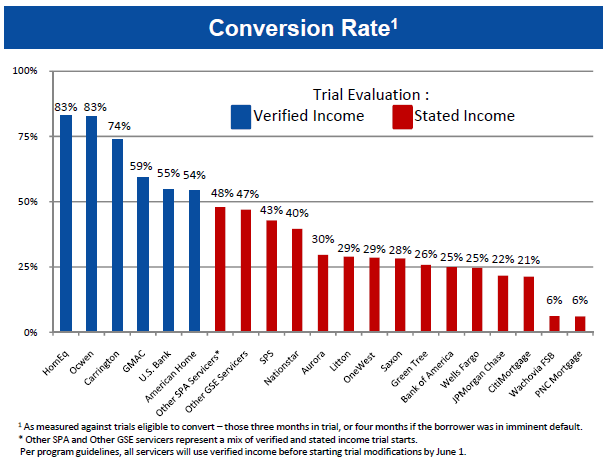 The April report unveils a new metric which gives servicer-specific information on rates of borrower conversion from trial to permanent status. The Treasury Department said that the data shows that there is wide variation among servicers in these areas, further demonstrating the need for transparency regarding servicer performance." In fact, the data should make a couple of servicers very uncomfortable. Two servicers - Saxon and JPMorgan Chase - had stunningly high numbers that had been in trial for six months or more, 76 percent and 78 percent respectively. These two were also among the servicers with the lowest conversion rates at 28 and 21 percent. Saxon is among the smaller companies however JPMorgan services the second largest pool of HAMP eligible loans. 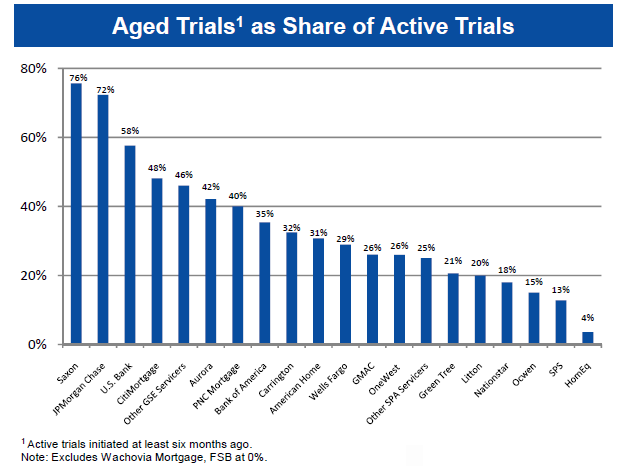 The importance of one change that will go into effect on June 1 is demonstrated by the servicer-specific data on conversion rates and the numbers of aging trials. Initially, servicers made the decision whether to begin the trial modification period before or after all required document were received and verified. Many servicers used stated income in order to get trials started and then collected income verification during the course of the trial. The new data makes it clear that this is not working, and effective June 1 servicers must have borrower documents in-hand before offering borrowers a trial modification. Without exception, those servicers with a conversion rate over 50 percent have begun trials only after borrowers had supplied the required documents. Without exception those that were relying on stated income and verification to company had conversion rates under 50 percent. MND has discussed recent Administration initiatives to motivate servicers to play a bigger role in helping families save their homes, but we wonder if servicers are totally to blame or if the Administration is starting to scramble as the HAMP program may be close to helping all who are capable of being helped. Borrowers continue to report that the overwhelming reason for their financial difficulties is loss of income. 60.4 percent say that was their primary reason for needing a modification. 10.2 percent cited excessive obligations and 10.2 percent said it was the illness of the primary borrower. 77.1 percent of borrowers were in default when they entered the program while 23.9 percent were at risk of default. Combine those stats with the fact that 6.7 million Americans have been unemployed for longer than 27 weeks and it's easy to see why HAMP is failing to convert more borrowers into permanent loan modifications. HAMP estimates that there are 3,275,249 delinquent loans and 1,702,134 borrowers that are eligible for a HAMP modification. With 1,487,597 trial offers already extended to the 1,702,134 pool of eligible borrowers and the number of Americans without a job for longer than 27 weeks continuing to rise, it appears HAMP may be running out of qualified borrowers. The true test of HAMP's success will be whether or not permanent loan modifications are able to avoid re-default. THIS SIGTARP REPORT calls attention to several factors limiting the effectiveness of HAMP. HERE are some outspoken opinions on the subject.